How can Textile Waste be designed out through the systematic regeneration of unsold garments? 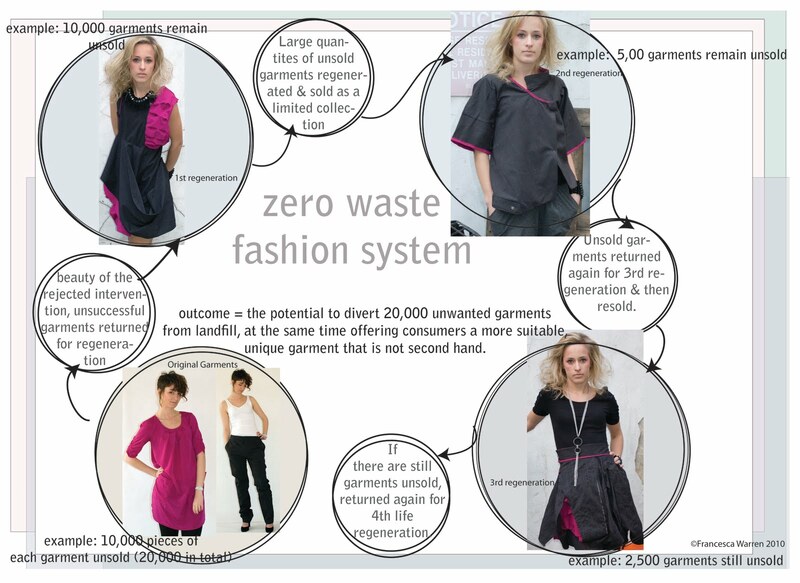 This diagram shows how the new system could work to reduce textile waste and get the most out of raw materials. 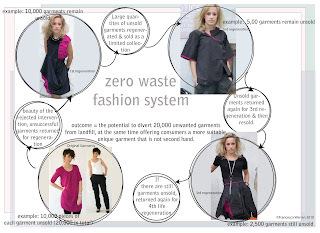 The project aim was to reduce the impact of unwanted clothing that is discarded; it makes sense to utilise what has been produced to maximum benefit, working to ensure that good raw materials aren’t wasted before they’re used. I wanted to create a sustainable system that offers more than an organic cotton t-shirt, whilst working towards reducing textile waste entering landfill. Instead of reducing the price of unsuccessful garments, often bought for the wrong reasons and never worn, the system works to produce second life garments to form part of a limited collection. This system could also provide companies with something to differentiate themselves from their competitors, at the same time taking sustainability issues into consideration. These unsuccessful garments have already made an environmental impact; it seems illogical not to regenerate them in a sustainable way that could make them more desirable. The outcome is a range of prototype garments that demonstrate how the new system could work through the regeneration of reduced priced garments (bought from high street sales) into their second, third and fourth life. All garments have been regenerated using the ‘zero waste’ concept – so the whole garment is used at each stage.